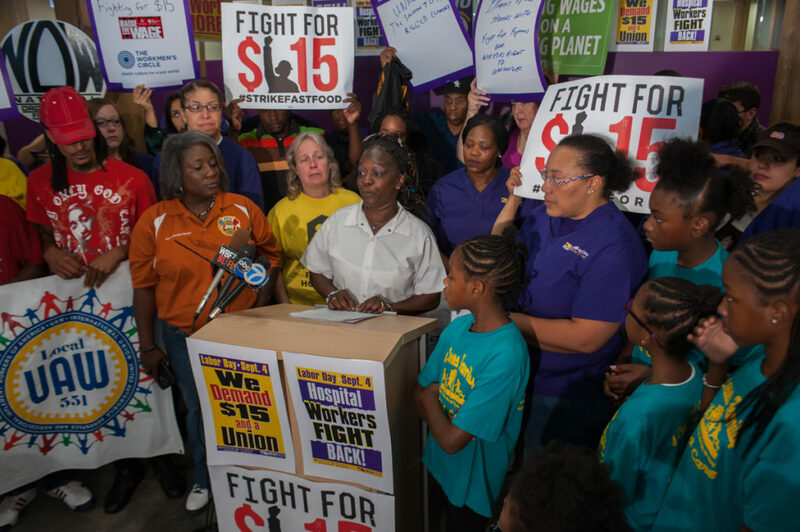 CHICAGO—Workers in Chicago will “strike back” this Labor Day when they help launch a national movement to organize more unions and elect politicians who drive worker agendas rather than those of corporations and wealthy individuals. Join your fellow workers on Labor Day. RSVP Today. 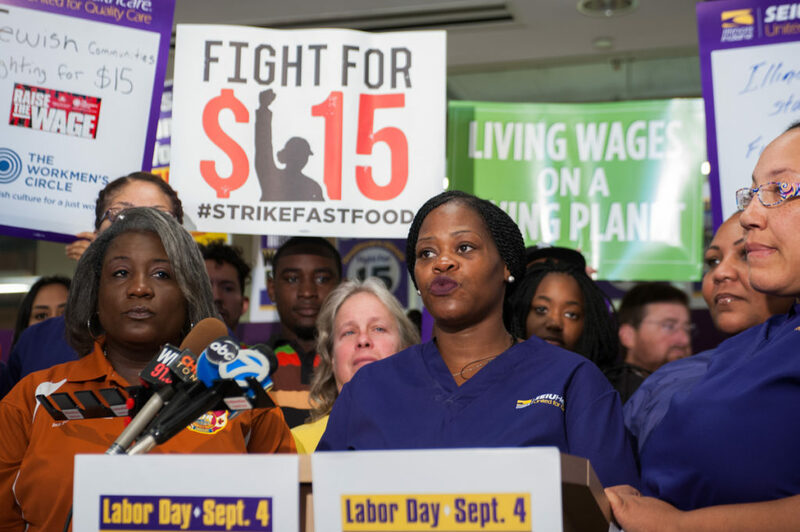 That announcement came during a press conference today at SEIU Healthcare Illinois, where adjunct professors, hospital, fast food, airport and other workers committed to the movement calling for union rights and a minimum wage of at least $15 that will launch simultaneously in cities across the country. The Chicago launch will include a protest at a Pilsen area McDonalds led by hundreds of fast food workers on strike, followed by rallies at the Thompson Center and at the American Hospital Association. For too long, corporations have controlled politicians, kept wages low and kept worker rights down, workers said. 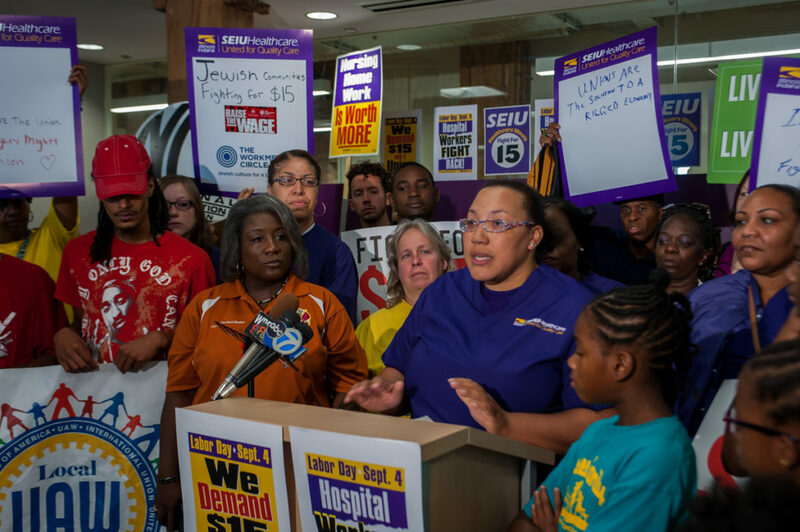 “Why the American Hospital Association,” asked Katina McDavis, a worker at Northwestern Memorial Hospital? “The agenda of the Association – just like large corporations – is to maximize the profits and power of hospitals. They keep wages low for frontline hospital workers and make it difficult to form unions, denying us our basic rights and voices on the job. “In fact, our entire economy is rigged against working people,” she said. 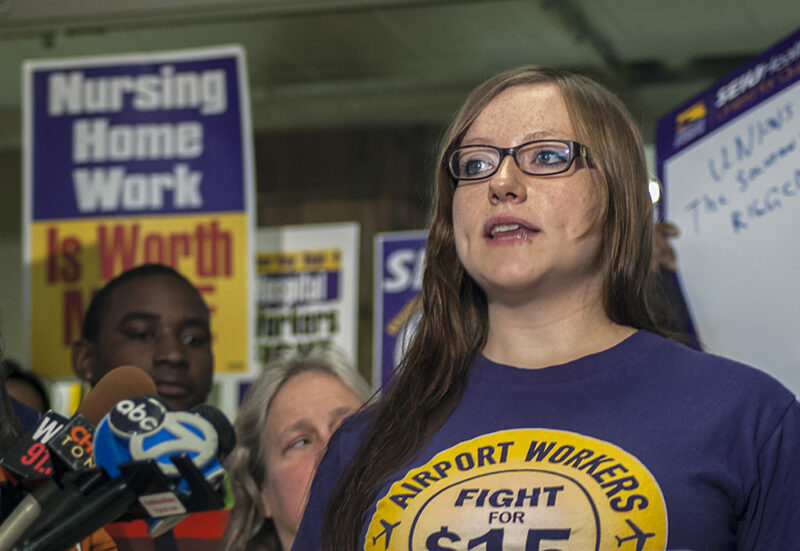 Fast food worker Laura Williams will be on strike Labor Day. She hasn’t received a raise in four years. Having a union would help to address that injustice, the 50-year-old single mom said. She also denounced Gov. Bruce Rauner for recently vetoing a bill that would raise the state minimum wage to $15. An aspect of the movement is for workers to dedicate 40 hours by November 2018 to identify and support politicians who will drive the worker agenda of $15 and union rights. 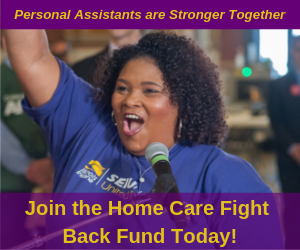 Don’t let Rauner get away with blocking our raises. RSVP for Labor Day. 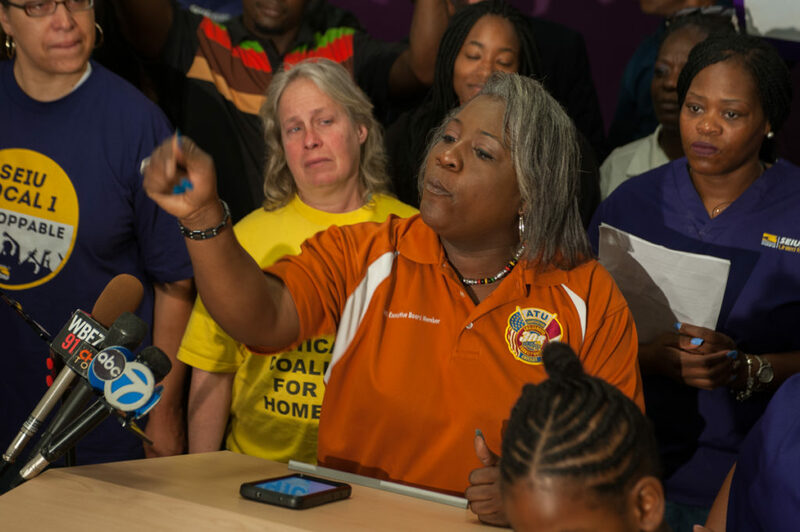 Union workers receive better wages, benefits and working conditions than non-union workers, said Oliwia Pac, who, along with other O’Hare Airport workers are seeking to form a union. Unions will help workers to address injustices, demand the dignity and respect they deserve for the work they do and address the low wages that keep them living paycheck to paycheck, she said. 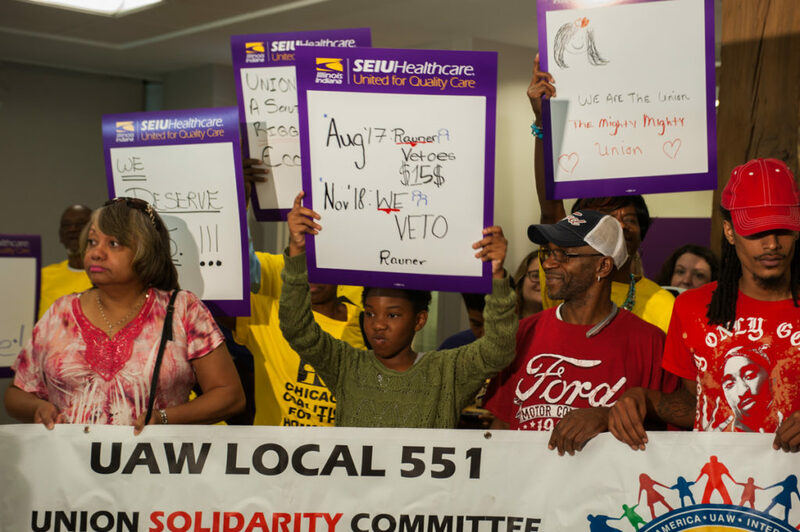 Cardiac unit worker Phyllis Johnson voiced concerns about dignity and respect on the job, saying America needs unions to balance the playing field against corporate power. “Can you imagine what it’s like trying to calm down a 250-pound patient who has a heart problem but is acting aggressively due to mental problems?” she asked. “If we had a union we would have collective power to address these situations. “If we had a union we could demand the proper training we need to do our jobs better. If we had a union we could fight stronger for wages that show respect for the work we do and demand that hospitals invest in their workforce and patients,” she said. Stand with workers like Phyllis. RSVP for Labor Day. 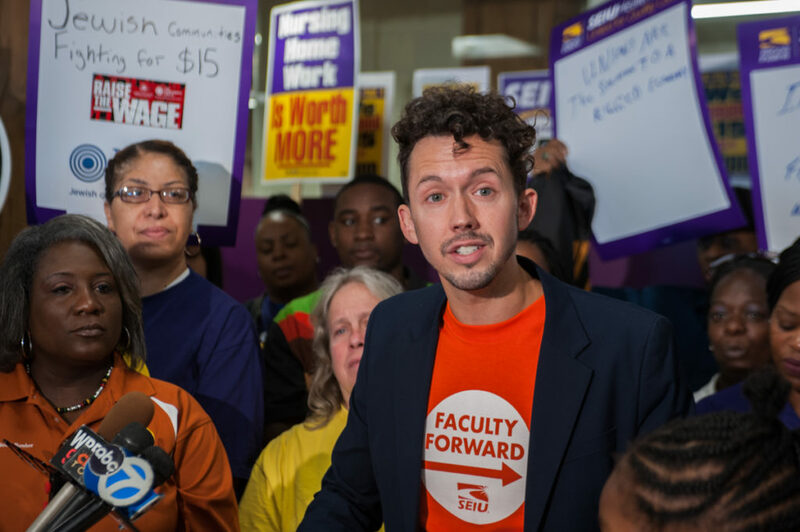 “I work for one of the richest and most prestigious institutions in the world, Northwestern University, and I barely made enough to survive and start a family for the last 6 years,” said Jackson Bartlett, a visiting professor and member of SEIU Local 73. Other speakers included the Amalgamated Transit Union (ATU), the Sierra Club and Communities United. “They’re still finding ways to suppress us and we won’t take it. This modern day slavery has got to stop. That’s why it’s important to formulate and organize,” said Debora Lane of ATU Local 308. “We can’t afford most things with minimum wage. We can’t afford food and rent in one of the richest countries,” added Merced Alday of Communities United.